A recent letter from Republican U.S. Rep. Mike Conaway about the proposed high-level nuclear waste storage site in Andrews has prompted Midland County Democrats to act in hopes of a better solution, and they’re reaching out for help. The Midland County Democratic Party held a press conference at the DoubleTree hotel Thursday and brought with them activist heavyweights Tom "Smitty" Smith, longtime director of Public Citizen Texas, and Karen Hadden, president of the Sustainable Energy and Economic Development Coalition, better known as SEED. "This is not just a Democratic thing to be concerned about," MCDP Chairman David Rosen said. "We invite our Republican brothers and sisters, as well as the unaffiliated. A waste dump 50 miles from Midland is not a good idea." Conaway issued a press release on Jan. 12 with comments in support of H.R. 474, the Interim Consolidated Storage Act. The bill seeks to amend the Nuclear Waste Policy Act of 1982 "to authorize the Secretary of Energy to enter into contracts for the storage of certain high-level radioactive waste and spent nuclear fuel, take title to certain high-level radioactive waste and spent nuclear fuel, and make certain expenditures from the Nuclear Waste Fund," according to the bill’s summary. A few companies are seeking to house high-level nuclear waste from dozens of decommissioned nuclear power plants that currently sit at reactor sites and from those to be decommissioned in the future. At issue is the Department of Energy’s inaction on taking possession of the waste and putting it into permanent storage, which by law it must do. One company that seeks to take the waste for temporary storage while the Department of Energy finds a permanent home for the dangerous material is Waste Control Specialists, which already had a low-level radioactive waste storage facility west of Andrews. WCS wants to house the waste above ground while the Department of Energy finds a solution. H.R. 474 would help move the process along, with the relocation of waste beginning in as little as five years. "This legislation allows the Department of Energy to cut through the red tape and enter into contracts with these licensed facilities, such as the one in Andrews, ensuring that nuclear waste will be properly stored until a permanent site is established," Conaway said in his press release. WCS initially wants to take 5,000 metric tons of high-level nuclear waste for above-ground storage, according to previous Reporter-Telegram reports. Its facility will have capacity for up to 40,000 metric tons. Smith said above-ground storage has "risks beyond what any community ought to take." He said that the waste should be buried underground, citing preliminary studies dating back to the 1980s that show perhaps the site with the best and safest geology is Washington, D.C. However, storage at the nation’s capital isn’t "politically feasible," he said. Smith also said above-ground storage is dangerous because it’s an open target for terrorist attacks. "We have a lot of concern about the potential of terrorist attacks," he told the Reporter-Telegram before the press conference. "This waste is basically going to be sitting on a big parking lot and visible to anyone who uses Google Maps. This is just putting a big nuclear target on West Texas and eastern New Mexico. Any terrorist worth his salt who wants to take a good shot at the United States would aim a rocket right at those locations." Smith had no comment when asked during the press conference why waste storage casks shown to survive a battery of tests in the late 1970s, including impacts on a "rocket-powered train," were no longer viable but permanent site storage research from the early 1980s was. Hadden said the canisters needed to be more robust because they will contain as much plutonium as the bomb that was dropped on Nagasaki, Japan. Codenamed "Fat Man," the bomb was dropped on the city on Aug. 9, 1945. About 22,000 people died on the first day and 17,000 more perished in the four months after, according to the World Nuclear Association. "Forty-two square miles of land could be uninhabitable from an accident," she said. Hadden said the steel casing for canisters in the U.S. are about a half-inch thick; in Europe, they’re up to 10 inches thick. Ultimately, Smith and Hadden argued that temporary centralized nuclear waste storage wasn’t necessary. They said the current sites are secure and that what’s really needed is a safe, secure and permanent storage site underground. Smith also expressed worry that temporary storage sites might wind up as de facto permanent sites because the federal government will no longer have incentive to actively find a forever home for the waste. "I don’t think (the federal government) will officially name Andrews a permanent disposal site, but it will never move because nobody wants it," he said before the event. Hadden and Smith are taking their message to Andrews on Saturday and were in Eunice, New Mexico, on Wednesday. The mini tour is setting up for U.S. Nuclear Regulatory Commission public meetings next week. The first is 7-10 p.m. MST Monday at the Lea County Event Center, 5101 N. Lovington Highway, in Hobbs, New Mexico. The second is 7-10 p.m. Wednesday at the James Roberts Center, 855 State Highway 176, in Andrews. "One of the opportunities within a democracy is to make your opinions heard," Smith said. 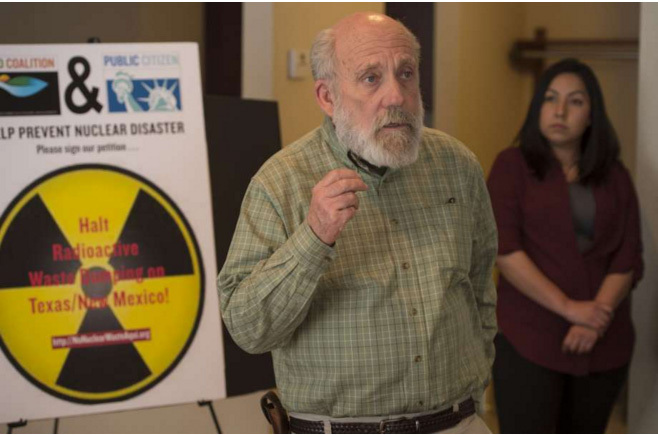 "Democracy is a contact sport, and this is your opportunity to have contact with the people who make these decisions and tell them what you think about (putting high-level nuclear waste) in West Texas and the consequences for tens of thousands of years." Hobbs, New Mexico. : 7-10 p.m. MST Monday at the Lea County Event Center, 5101 N. Lovington Highway. Andrews: 7-10 p.m. CST Wednesday at the James Roberts Center, 855 State Highway 176.